Did you make any New Year’s Resolutions or a wish list to achieve for this year? If so, how are you getting on with them? 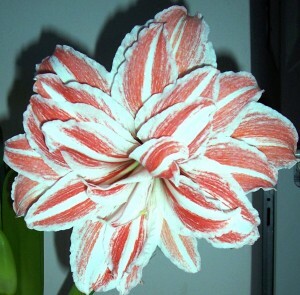 I won a boxed Amaryllis in a raffle at a Christmas Fair in November. I was really pleased, as I love their beautiful blooms, which brighten my days during the darkness of January and February. However, I put it on my kitchen worktop and forgot about it, as I was busy preparing for the festivities of Christmas and New Year. One day, I was suddenly aware that it was sprouting out of the side of the top of the box! I felt so guilty and mortified that I had ignored its needs, that I dropped what I was doing and opened the box carefully so that I didn’t damage it any further. The compost it was in was dry, the leaves were yellow, and the stem had a right angle bend in it in an effort to reach the light. I gave it water, placed it on a sunny windowsill, apologised to it for my lack of care, and left nature to heal it! Miraculously, the next day, it was recovering well. The stem was beginning to straighten itself out, the leaves were turning green, and the bud was opening. I found a stake to support the stem, and watched it daily, continuing to nurture it. It rewarded me – and itself – by blossoming into not one, but two beautiful blooms, as you can see from the photograph. The experience I had with my Amaryllis clearly illustrates the quotation by Anais Nin, and our pain when we are resisting the need to blossom ourselves and make the most of what we have to offer. I was amazed that all the Amaryllis needed was some nurturing support in achieving its need to blossom. Maybe you need some help and support to achieve your aims for this year? If so, do contact me to see how you could blossom like my beautiful Amaryllis……….it would give me great pleasure to help you.